Nicole Atkins came out with just a guitarist and a drummer; she carried no instrument herself. Despite only playing for about half an hour, her set packed some power and variety. At first I was picking up a sort of folk vibe, but then it shifted to something more like blues (or even hard rock! ), and as the set progressed, I also heard bits of indie rock, such as guitar phrasings from the Radiohead playbook. The highlight was clearly Atkins' own voice, as she was always able to maintain strength, volume, and range. Her guitarist was solid and did a great job making a bedrock for Atkins. He must have been using a loop pedal for the more intense sections, as at times he would play leads or solos that seemed fuller than what one guitar is capable of. The drummer wasn't showy or flashy but skillfully punctuated the rhythm of the songs. It was the type of skillful playing that you wouldn't notice without looking for it, although the small number of musicians on stage made it easier. The only weak spot was that the songwriting was inauspicious and the lyrics merely par for the course. 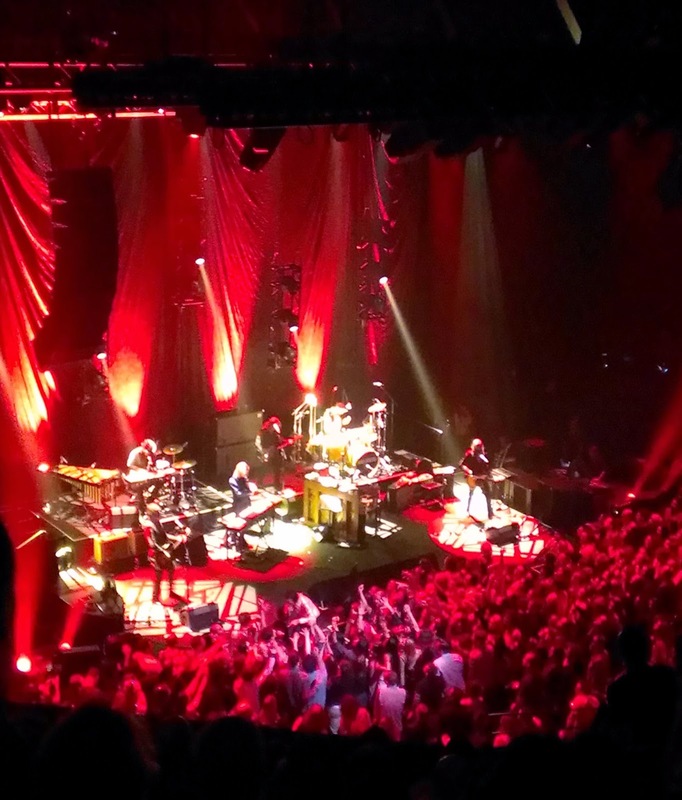 Nick Cave & the Bad Seeds, despite their thirty-one-year history, are still a growing and changing band. Their most recent studio album, Push the Sky Away, released in early 2013, mostly features keyboard- and loop-heavy songs with mysterious shapes and extended, meandering trajectories. It's a subtle, slightly unnerving record, leaning on the edge of predicting a strange technopocalypse. It's borderline ambient at times. This comes after the band made Dig, Lazarus, Dig!!! in 2008, a raucous and loose album seemingly influenced by the garage blues punk side project Grinderman. A more extreme about-face is hard to imagine, but this is the band that followed the rocking Tender Prey with the piano-based The Good Son and the violent Murder Ballads with the serene The Boatman's Call. When I saw the Cave & Co. on tour in 2008, Cave picked up a guitar for about half the set and played in a loose, noisy, almost cavalier style. Before the debut of Grinderman in 2006, Cave rarely played guitar, preferring piano or nothing. This time around, Cave returned to his previous form: he never touched a guitar, and only played piano on less than half of the songs. The other source of growth and change in the band is the revolving door of musicians that accompany Cave. Founding member and guitarist Blixa Bargeld left in 2003, long before I saw them the first time, but in the meantime, founding member/guitarist/multi-instrumentalist/songwriter Mick Harvey left the band in 2009. Ed Kuepper joined on guitar to temporarily fill the void, but only on stage. By the time recording commenced on Push the Sky Away, it seemed as if the band couldn't handle being left with Nick Cave as the only original member. Quite unexpectedly, Barry Adamson (bassist on the band's first four albums) was suddenly found playing bass on two tracks, despite that longtime bassist Martyn P. Casey is still a regular member. Additionally, without any guitarists left in the band, a new name cropped up, playing twelve-string on two tracks: George Vjestica. As the tour for the album commenced, regular drummer Thomas Wydler was not present, supposedly due to illness. Despite that the band has another full-time drummer (Jim Sclavunos), Adamson moved to drums – and filled in some keyboard work. Kuepper was again found on guitar. (This can be seen in the Live at L.A. Fonda Theatre video available on the official website, recorded in February 2013.) Although the band traded Kuepper for Vjestica on stage in May, by the time the band recorded Live from KCRW in November 2013, the band was trimmed to a five-piece without a guitarist or regular keyboardist Conway Savage. Adamson accordingly focused more on keyboards. Now that Savage and Vjestica are back, Adamson is splitting his duties between drums, keyboards, and xylophone. Wylder still remains inexplicably absent. Despite all the shake-ups, one thing remains clear: violinist/noisemaker/tenor guitarist Warren Ellis is the band's undisputed second-in-command after Cave. 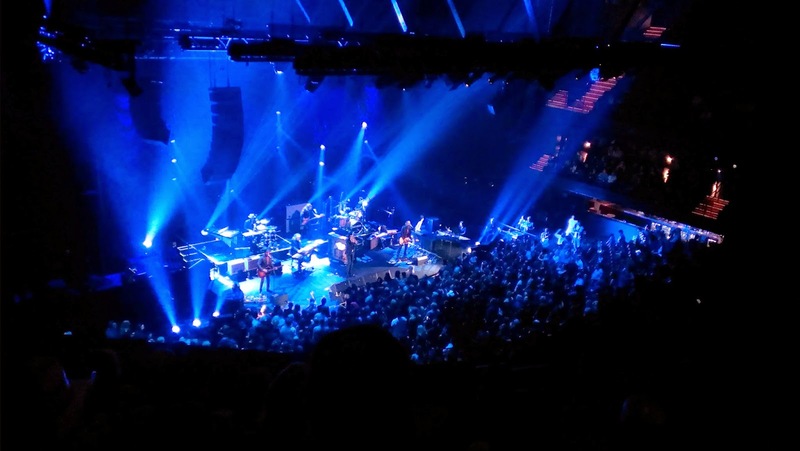 Just as when I saw the band in 2008, Ellis dominated the sound spectrum and seemed to call the shots of how mellow or intense the sound levels would be. While Cave's wild guitarwork in 2008 seemed to render Harvey redundant, in Harvey's absence and without Cave's guitar, Ellis' tenor guitar and general noise construction still managed to make Vjestica an almost unnecessary addition. Vjestica mostly played acoustic and/or twelve-string parts, but even when he picked up an electric, he was decidedly in the background. Adamson, too, was oddly obfuscated. His drumming usually merely doubled Sclavunos' parts, and his keyboards were often lost behind Savage and Cave's parts. His only opportunities to stand out were on a few songs where he played distinctive keyboard parts or moved to the marimba. I like Adamson, and he's had a long and distinctive career, but he seemed relegated to the shadows. Nick Cave was in top form, slinking around the stage and staring down audience members right in the eyes, but the band felt loose. They wield power and they still make a good sound, but they weren't always quite on target. Much like on the last tour, they don't come off as a very tight band, despite their years of experience. To be fair, these complaints hardly matter. The songs still rock or roll just as well as you could hope, and Cave always remains keen and sharp. The song selection was good, comprising about half of the new album and a varied run-through of the band's long back-catalog. The setlist does bear remarkable similarity to the show I saw in 2008, but with the Lazarus songs replaced by new songs. I wish they'd throw more curveballs and reveal some more tricks up their sleeve, but how could I complain about "The Ship Song", "Do You Love Me? ", "The Mercy Seat", and so on? I will complain that "The Lyre of Orpheus" is one of my least favorites from the otherwise quite good Abbatoir Blues/The Lyre of Orpheus, but that was the only selection they played from the double album. In fact, nothing else was played from their oeuvre between 2001's No More Shall We Part and the new album. Also, as time goes on, I have a harder and harder time appreciating "Stagger Lee", which is just too crass and harsh for my tastes anymore. I know it's supposed to be a cathartic, dark, fabled storytelling event, but it loses me. It was hard not to feel like the band was going by the numbers at times. Cave and Ellis put in a lot of energy, and the band is still good, but there is an element missing. Maybe it's just Harvey or Bargeld. (Certainly "The Weeping Song" is worse off without Bargeld's vocal part.) I like Barry Adamson, but I feel like he was just filling in holes in the space of the other members. I like Push the Sky Away and I like how the songs are done live, where they sprawl and grow even more, but some of the old songs feel stale, like the well overdone "God Is in the House". Maybe it would help if Ellis would share his sonic space a little more.